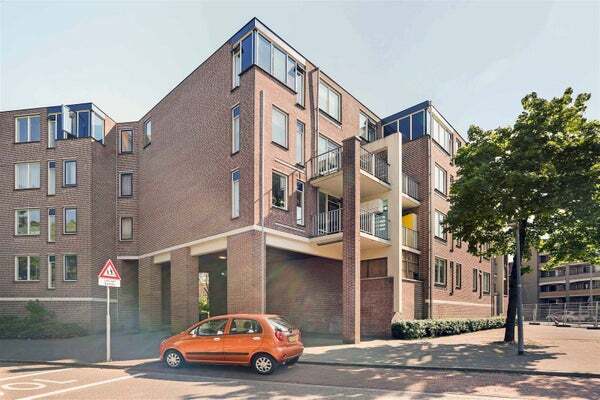 A short distance from Central station Hilversum, shops, schools and good roads located 2-room apartment on the 4th and also top floor of the apartment complex. Behind the apartment complex there is a spacious car park, where the entrance to the complex is located. The apartment of 46 m2 includes a living room with laminate floor and open kitchen with appliances, a neat bathroom with walk-in shower, toilet, sink and washing machine connection, a spacious bedroom, a shared roof terrace and a large storage room with electricity in the basement from the complex. entrance, closet with preparation c.v.-boiler, bathroom with walk-in shower, sink, toilet and washing machine connection, living room with open kitchen with dishwasher, microwave oven, gas cooker, fridge and freezer, bedroom.